This form is drafted for a short term executive suites lease. The form provides for an a la carte selection of furniture and services needed by the tenant, with individual charges for each item. (b) PREMISES: ____________________ (See Exhibit "A"). commencing on ______________, and shall automatically renew for 1 year on each anniversary date absent sixty (60) days written notice by either party to terminate this Lease. (Subject to early termination provisions under section 3.1). ADDITIONAL FURNITURE: ___________________@ $_______per mo. ____ Deluxe Instrument with One Business Line@ $___, ___Additional Instrument(s) only @ $___, _____Fax and/or Modem Line @ $___ each, ____Catagory 5 Cable Connection(s) @ $____ each,____ Additional Business Line @ $____, ____Additional Voicemail Box @ $____, ____ "411" Directory Listing @ $____ each (allow 4 weeks), ___T1 Internet (full bandwidth) Connection @ $____ first connection, $_____ each additional connection. (f) PARKING: ______ space(s) @ $________ each: $ ______per month. (h) TOTAL MONTHLY BASIC CHARGES: $_______________. $_________ including a non-refundable painting/cleaning fee of $__________ per office. (l) TELEPHONE INSTALLATION: $__________ . Additional charges for any changes after initial installation is completed or if additional wiring is required. T1 CONNECTION CONFIGURATION CHARGE $___________. (m) BUILDING DIRECTORY LISTING: $_______one time charge (allow 4 weeks). (n) SIGNAGE: $__________________NOT AVAILABLE at this time. (o) TOTAL MOVE-IN CHARGES: $_____________ (Due upon Lease execution). 1.1. LEASE. This Professional Office Lease (hereinafter "Lease") is an executive suites lease together with the provision of furniture and services indicated above or otherwise as provided herein. 2. 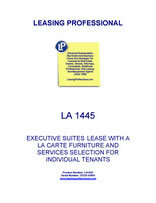 PREMISES: Landlord hereby leases to Tenant and Tenant hereby leases from Landlord the Premises ("Premises") set forth in the Basic Lease Terms herein which are part of a larger premises operated by Landlord ("________________ EXECUTIVE SUITES) ("hereinafter "the Executive Office Complex"). 3. TERM: The term of this Lease shall commence on the date set forth above and shall continue for the term set forth in the Basic Lease Term section described herein at paragraph 1. Such term, and any extension given with the express written consent of Landlord or by the automatic renewal provisions set forth hereinbelow at paragraph 21, Termination, is hereafter referred to as "term". If Landlord is unable to deliver possession of the Premises to Tenant at the commencement date of the term, Landlord will not be liable for any resulting damage, nor will this Lease be affected, except that Tenant will not be obligated to pay the basic monthly rent as hereafter defined, until Landlord delivers possession. 3.1. EARLY TERMINATION PROVISION: If Executive Office Complex should fall below 30% occupancy during the term of this Lease, Landlord hereby reserves the right to terminate this Lease upon thirty days (30) written notice to Tenant, provided that all such leases relating to the tenants of Executive Office Complex are terminated concurrently with the termination of this Lease. (d) In addition, in the event any check of Tenant should fail to clear the bank and is returned unpaid to Landlord, them immediately upon written demand of Landlord to Tenant, Tenant shall also pay a "Returned Check" processing fee of Fifty Dollars ($50.00) for each such check to cover Landlord's costs and expenses in processing each returned or unpaid check. 5. SECURITY DEPOSIT: Upon execution of this Lease, Tenant shall pay to Landlord the amount set forth in the Basic Lease Terms herein as a deposit ("Security Deposit"). Such amount shall be held by Landlord as security for the full, faithful and complete performance by Tenant of all terms, covenants and agreements to be kept by Tenant hereunder, or under any other agreement between Tenant and Landlord. Security Deposit is not to be used as Last Month Rent. If Tenant fails to perform any of Tenant obligations when performance is due, Landlord may apply the Security Deposit to the payment of any monthly charge or any other payment due from Tenant, or of any sum which Landlord may spend or be required to spend by reason of Tenant's failure. Upon written demand by Landlord, Tenant will pay to Landlord any amount so applied so that such Security Deposit is returned to its original amount as specified herein. If at the end of the term of this Lease Tenant has performed all of the provisions of this Lease, the Security Deposit, or any remaining balance, will be returned to Tenant, without interest, less cleaning/painting fee, within forty-five (45) days after the end of such term.